We can't show pictures of the Christmas Stamps that Royal Mail have shown in their Philatelic Bulletin, and on their website, and in their stock list - and which are shown on at least one UK website, so I thought you might like to get in the holiday mood with some stamps from other countries. I do like the US Magi stamp. Makes a change from so many 'Madonna and Child' stamps. The Winter Greenery Faststamps are also available on eBay. UPDATE 13 October: Just to confirm that different Postal Authorities have different approaches to their philatelic programme (after all, we're often told that nobody else buys special stamps!) 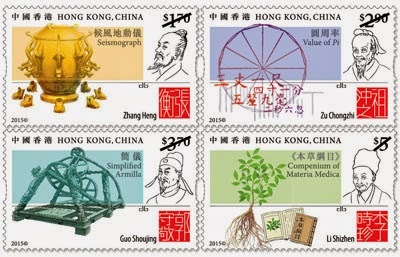 here is a Hong Kong set that will be issued on 8 December - 2015 ! Hong Kong's preliminary programme, subject to change of course, can be seen here - not just a list but pictures as well. So Mrs Goggins has become Scrooge... We have always had plenty of notice of the, usually insipid and foreign designed Xmas stamps in the past. Shame on them. Were it not for you they would sell far fewer commemoratives and they ought to know which side their Xmas cake is buttered. Humbug, Sir! How ridiculous. The stock list is freely available on the Internet at http://www.royalmail.com/sites/default/files/Royal-Mail-Stocklist-for-web-Winter-2014.pdf The Christmas stamps are on the front cover! I've just had a look at the stock list. I can see that the Christmas stamps have very unique images. Royal Mail obviously has an embargo to prevent the population getting over excited and forming large queues once they have seen what will be on sale this year. I guess anyone who is interested must have seen the designs by now. The real mystery here is why Royal Mail would think it worthwhile to embargo you from depicting such dull, unimaginative and tiresome products whilst publishing the designs in several media. Surely no-one in Royal Mail can believe that your depiction of them would spoil any press launch when what will be revealed to the press is so underwhelming. And why is everyone depicted in the designs, apart from the snowman, thin and stick-like at a time when the British population is generally overweight and big-bellied? The worst GB Xmas stamps ever? And why the obsession with the Dickensian depiction of a white Christmas? Haven't these people heard of global warming? Didn't notice the warmth in December 2010! I do quite like the first class design but one of the last times I posted something in the snow, on the way back home I lost my legs from beneath me and ended up flat on my back. Have Royal mail sponsored a new Christmas cartoon to replace the Snowman and using these as publicity for it? Entire Christmas range has now been published in this month's Gibbons Stamp Monthly. Therefore why are Royal Mail stopping what is probably the best current source of accurate GB stamp information on the internet from featuring them? My sub-postmaster received the Christmas stamps 3 weeks ago, yet only received the 97p of today's issue yesterday (having earlier received the first class ones). Was there a problem with the Prime Minister 97p sheets? Not that I know of - I received mine over a week ago, and I ordered them quite late. As I mentioned elsewhere, the preliminary designs showed the whole set as 1st class, but I wouldn't think the decision to change had any impact on the printing and delivery. It seems odd to issue the winter greenery pack as standard letter and large letter rates for both 1st and 2nd class strips. 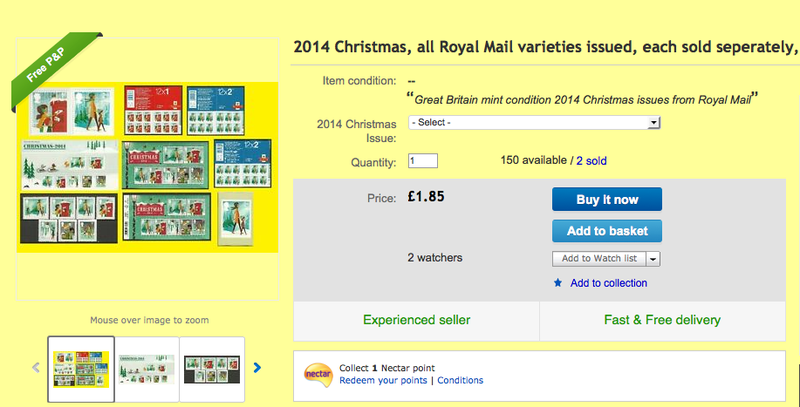 I’m guessing the set in two strips (as shown by ebay sellers is correct) rather than individual values as show on the Royal mail website. Any news anbout the Christmas Pop ups yet?